Another year is coming to an end but that doesn't mean McDonald's sweet surprises are over! The holiday season is a time to be extra generous and indulgent and what better way to celebrate it than by sharing a treat with a friend, family member, or someone that made your day just a little bit better? With Christmas just around the corner, McDonald's introduces two new limited-time offer McFlurry flavors, KitKat® McFlurry and KitKat® Green Tea McFlurry, that are sure to spark the spirit of joy and giving this time of the year. The luscious vanilla soft serve mixed with either crushed KitKat® Milk Chocolate bits or crushed bars of KitKat® Green Tea will definitely bring smiles to anyone and will satisfy their sweet cravings. Delicious and worth sharing, the new McFlurry flavors will inspire Filipinos to create more sweet moments for and with others in this season of giving. 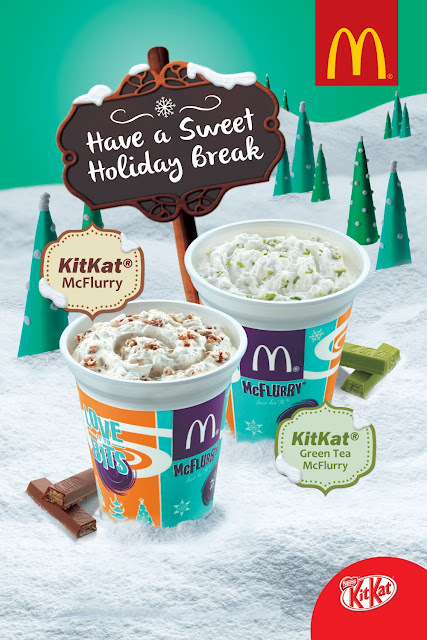 The new KitKat® McFlurry and KitKat® Green Tea McFlurry are available for a limited time only in all McDonald's stores nationwide via Dine-In, Take-Out, Drive-Thru, and McDelivery. Customers can also satisfy their sweet cravings while on the go by going to Dessert Centers and Take-Out Counters which offer the new treats in mini cup sizes. Feelin’ the Christmas spirit with the new desserts? Share your sweet indulging moments on McDonald’s Facebook page, http://www.facebook.com/McDo.p h, or tag @McDo_PH on Twitter or Instagram.